Spend your holiday in this rustic house, located right at the forest's edge. You will stay in a cosily furnished apartment on the ground floor of the house. You reach the apartment via a private exterior entrance. Parking is available right at the house. 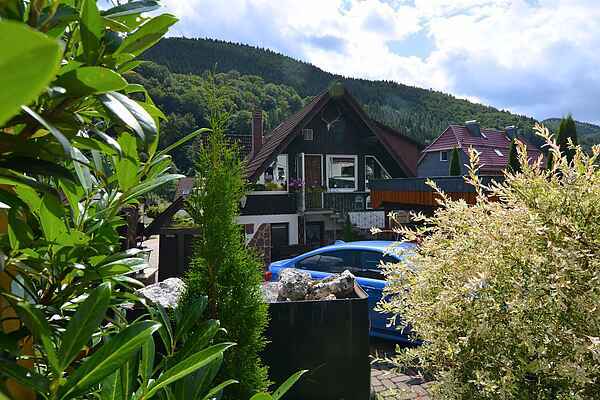 The informal Harz-style inn (located in the same house) offers good home cooking. After a long hike, this is a lovely place to end the day in a relaxed atmosphere. You can spoil yourself in the beer garden, idyllically located on a stream. In the winter you can enjoy a homey atmosphere around the crackling fire place. You will find opportunities to hike, rest and relax amidst the beautiful landscape. The large leisure centre with flat footpaths, a miniature golf course, water treading basin, solar-heated open-air pool and a large adventure playground offers a change of pace for every age. The "Knollen" (mountain) and the "Hanskühnenburg" (mountain hut in the Harz mountains) are especially popular destinations. Other popular excursions: Herzberg Castle (also known as the Welf Castle of Herzberg); Bad Lauterberg and the Oderstausee (dam), exhibition mine and water park, Sankt Andreasberg with its summer toboggan run and much more.